Say hello to independence, social mobility, confidence and style with the brand new Jazzy Air Power Wheelchair. The Jazzy Air Power Wheelchair is the pinnacle of all mobility items, as it elevates your independence and social confidence in style. The brand new Jazzy Air allows you to drive your power wheelchair while sitting at eye level with your friends or family as they walk. With an all-in-one hand control design, you can adjust your speed, drive, and elevate or lower your seat while driving or remaining stationary. Regain the feeling of having face to face conversations, going shopping on your own and reaching the top shelf, or riding up to the bar or counter. The Jazzy Air gives you the independence you have been looking for, along with style. Pick from any of the nine vibrant colors they are offered in. 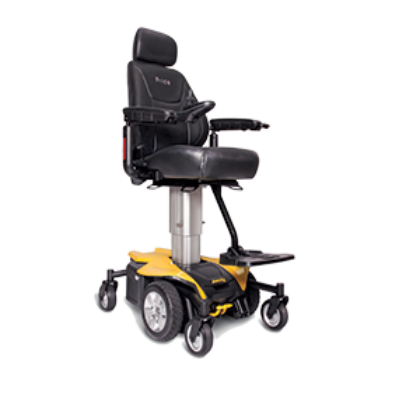 Similar to the Pride Go-Chair, the Jazzy Air provides a smooth ride with an intelligent braking system. Featuring a cruising speed up to 4.0 mph with tight turning radius of 22.5″, the new Jazzy Air wheelchair is great for outdoor or indoor use, especially with navigating household hallways and kitchens. Visit our store in Parker, Colorado to test drive the Jazzy Air or any of our other Pride Mobility products.